So I got all those borders around all those blocks and said, "I'm Done"! 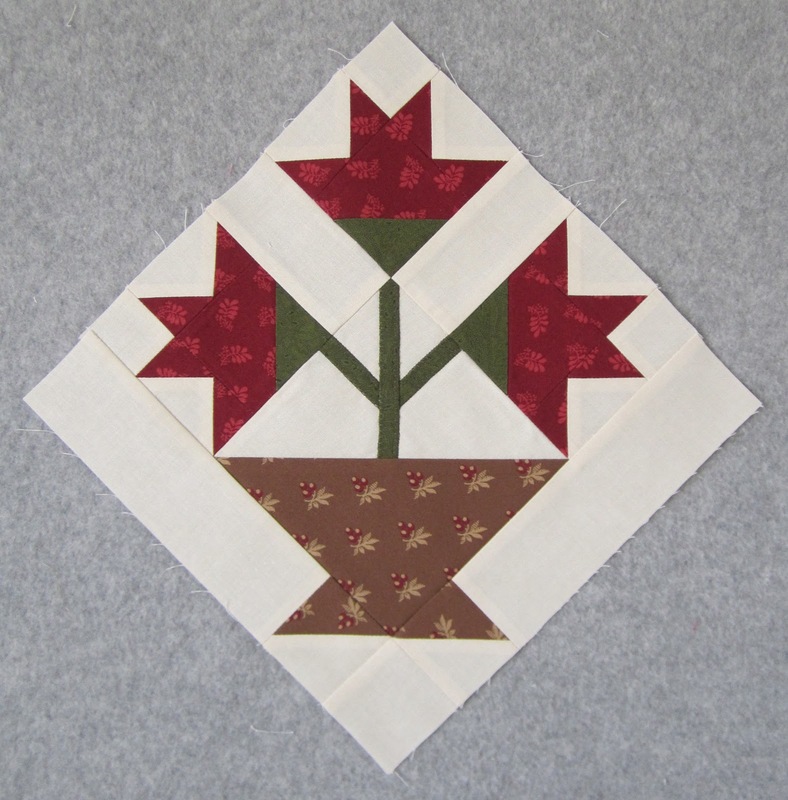 Then I remembered someone along the line suggesting that I put a little 2 inch outer border using the background fabric around this quilt, to make it look like it's floating, so I did, and then I said, "I'm Done"! 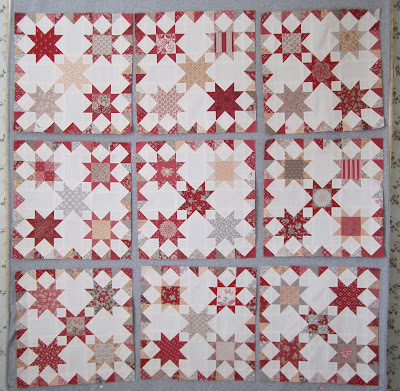 This is Stars Above My Red Chateau and Lifetime Quilt Number 102. It finished at 73" x 73"
It has approximately 2,405 pieces. This quilt was very easy to piece and it's a perfect size to hang in my living room, I could not be happier with it now that it's all done. I think this pattern would look great using any style of fabric and would be a great stash buster. That sashing alone could empty someone's scrap basket. I've not seen any other 3 Barns out there in blogland, if you've made this quilt send me a link or a picture. Next up, I've decided to tackle those bias strips and start on Carolina. The weather has been so uncharacteristically cold little green daffodil and tulip tips have yet to peek out of the ground. If I want flowers around my house it looks like I'm going to have to piece them, perfect timing for Carolina. It doesn't seem like I'm blogging consistently about Stars Above My Red Chateau, also known as 3 Barns. But I do continue to make progress. Just in case you've forgotten, here are some time lapse photos to refresh your memory and show you my progress. The pattern is Three Barns by Miss Rosie's Quilt Co. 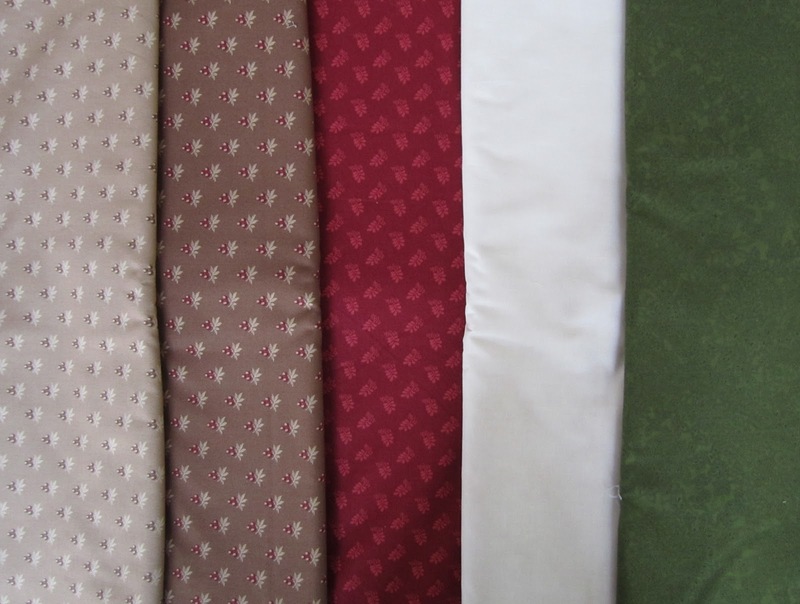 The fabric is Rouenneries Deux and Chateau Rouge by French General for Moda. 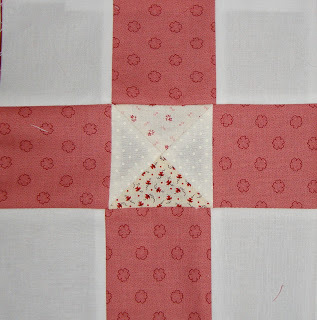 So I started with these pretty but plain star blocks. Then a whole lot more bling. The sashing is going on easily and the best part, once I get those last 3 blocks done, the quilt is done! No borders, woo hoo! These are my favorite kind of patterns. Those patterns that have 3 or more rows of borders are killers. 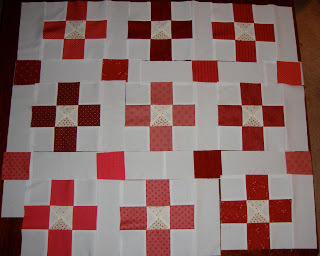 You think you're done when you get all the blocks together but you really have 3 more days of measuring and sewing to go. Diane in Illinois - if you send me your email address I'll explain how I made the fans for Evening Bloom. 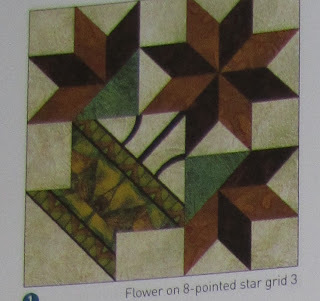 The last time I blogged about this pattern it was to tell you that I was eager to get started on it but that I was searching for the perfect green fabric for the flower stems. 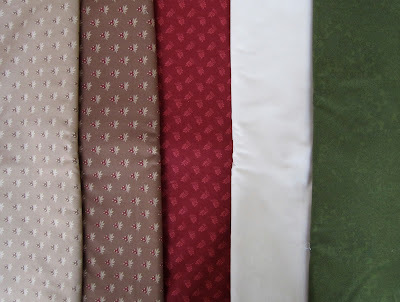 I found the perfect green and here are the fabrics I have selected to make this pattern, from left to right, Battle Hymn by Barbara Brackman for Moda, Darker Battle Hymn by Barbara Brackman for Moda, the red is Lately Arrived from London by Barbara Brackman for Moda, the background fabric is a Moda Solid and the green is by Timeless Treasures and is called Spring. Once I had the perfect green to go with the rest of the fabrics I just knew this would be my next project. 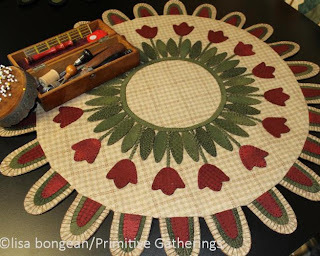 I got out the pattern to study and rewrite in Thelma-ese, something I always do before I actually start a project, but was disappointed to find out that the handles on the basket and the stems of the flower are appliquéd. Now I probably should have figured out that those round basket handles were appliquéd before I opened the pattern, but I just didn't really give it any thought. I thought for sure the stems would be pieced, I don't think I've ever run across a Bonnie Blue/Red Crinoline pattern that had any appliqued pieces. 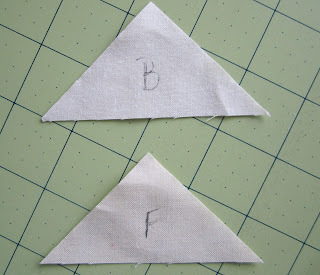 Which brings up this question, are we allowed to open up a pattern in a shop and read it before we buy it? I never do because I thought it would look like I was trying to figure out how to make the pattern without buying it. Had I read this pattern in the shop I don't think I would have bought it. And now I have all this fabric to make this quilt. 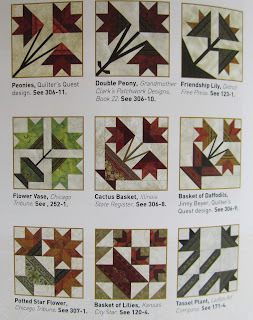 I'm going to see if I can find a pieced Carolina Lilly basket block, I have Jenny Beyer's book of pattern blocks that probably has something I can use. And I'm guessing those round basket handles are just going to be forgotten! I really thought once I had that green I would be going to town on that project, but not quite yet. I'm STILL organizing my fabric, from the notes I've been getting it seems like the majority of us have Spring Cleaning Fever. When I started my fabric reorg I didn't really have a plan, but now that I'm well into it I have refined the process and it's going smoother and faster. First off, I added more bins, I went from 4 to 8. There's no way I'm going to be keeping 8 bins worth of fabric, each bin holds over 250 fat quarters, I won't do the math, but you get the point, that's a lot of fabric. But having bins that are more empty than full makes adding new fat quarters easier. I'll be combining some of the bins once I'm done. 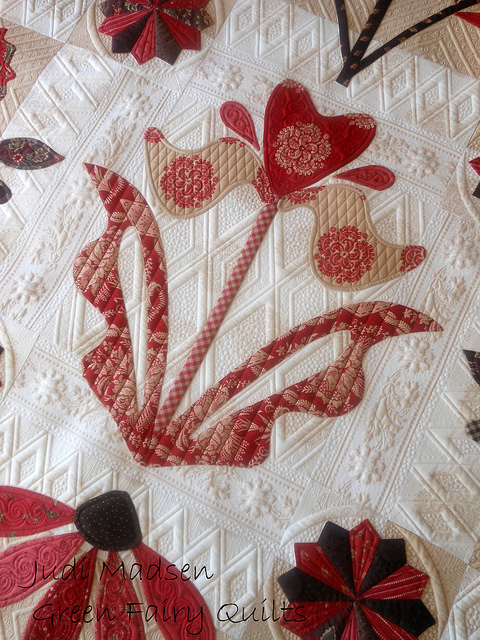 I was spending at least an hour during the day, when the light was the best, cutting, folding and storing the fabric. 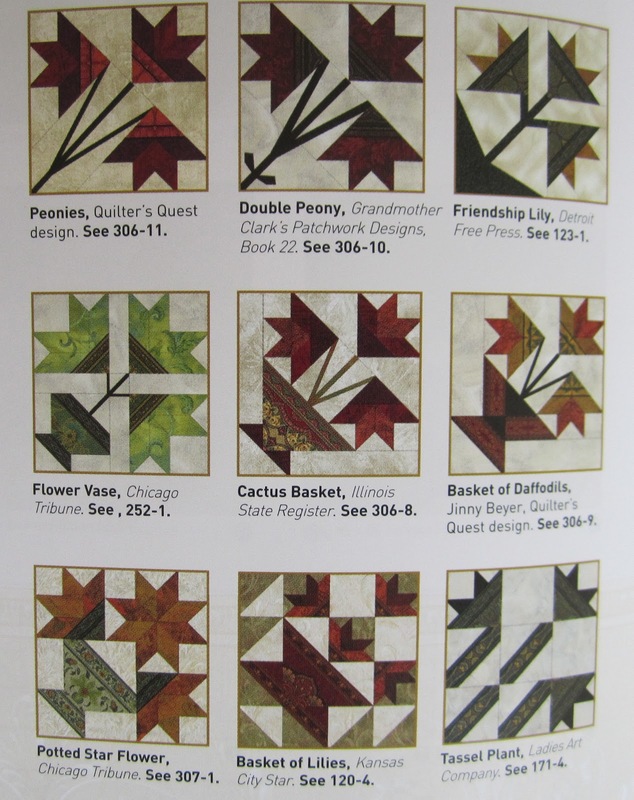 I think I mentioned earlier that I'm basically going to a fat quarter system, cutting yardage that won't be used for a border or sashing into fat quarters to add to the fat quarters I already have. 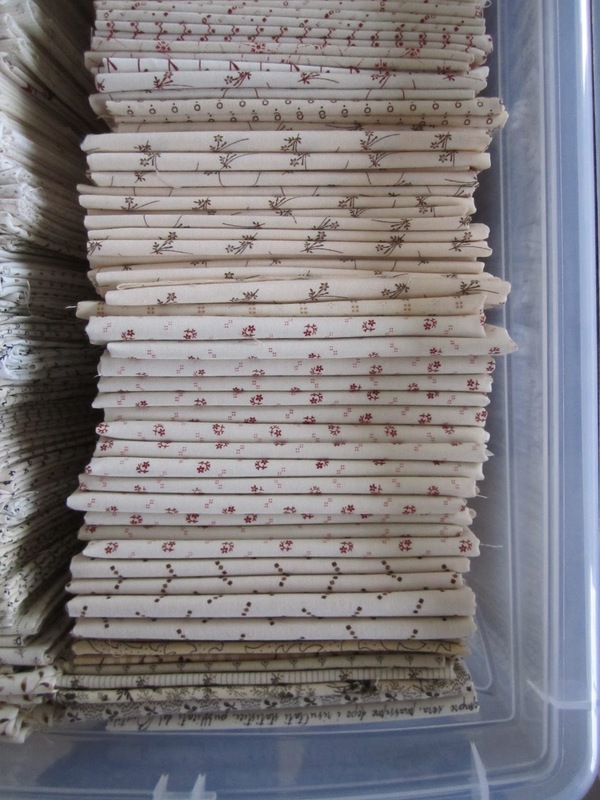 I'm now taking the yardage that I cut into fat quarters and folding them at night, while I watch TV. I don't need good light for folding. I then stack the newly folded fat quarters by the bins, so that when I do have good light I can just sort the fabric into the bins by color. I'm not sure if it's really going faster, or if it just seems like it's going faster, but I feel like I've really made significant progress this week. I'm almost done cutting the yardage into fat quarters. And while we're speaking of fabric, playing with all my fabric has made me think about why I have the colors and prints I do, and brings to light the colors that I don't have. 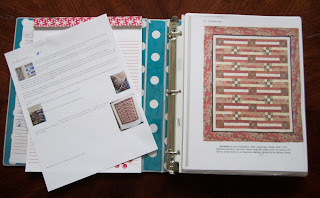 It's been good for me to think more about my fabric, so maybe that's why I found this little helpful hint from Lissa at Moda Lissa, so interesting. 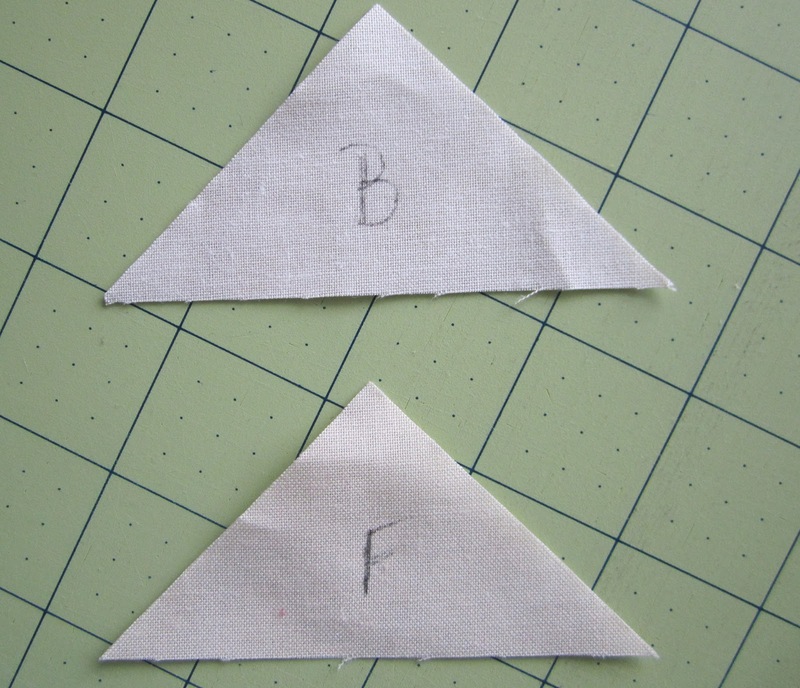 She was talking about solids and said if you want to make a quilt solely from solids, but are not sure how to select your solid colors, pick a print fabric you like with several colors, pick solids that are in that fabric, then don't use the print fabric, just use the solids. I thought that was very clever. She does a better job of explaining the whole thing, read it here if you missed it. 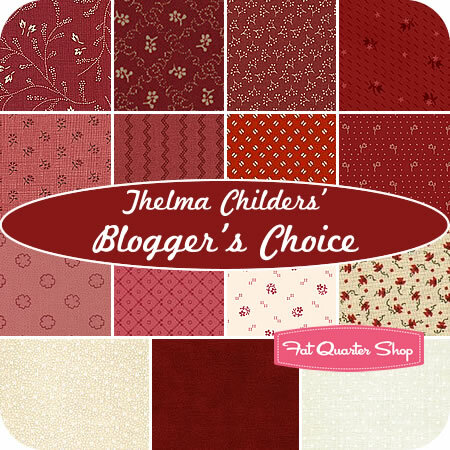 The Fat Quarter Shop has sold all the Thelma Bundles, thank you so much! You have no idea how worried I was that I would pick a bundle of fabric that no one would be interested in buying. If you didn't buy your bundle yet, there is one left, and it's free, click here to enter the giveaway at the Jolly Jabber. You have until March 19th. Nothing much going on at my house this weekend, I'll be watching basketball, sorting fabric and sewing, sounds pretty perfect really! Hope you have a pretty perfect weekend too! The Fat Quarter Shop's blog, the Jolly Jabber, is talking about the Thelma Bundle today. and my Tickled Red table mat. But here's something you haven't seen. Someone else is having fun with the Thelma Bundle. Isn't that a cute variation on the 9 patch? If you're making something with your Thelma Bundle be sure to send me some pictures so I can share them with everyone else. And if you don't have a Thelma Bundle, I think there's some sort of contest going on where maybe you could win one. Check it out! 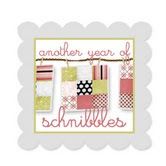 Thanks again Kimberly for including me in your Fat Quarter Shop promotion, it's been nothing but fun. I really missed that hour I lost in the middle of the night Saturday night, how about you? Then there's the time I spent changing all the clocks because the time changed, more time gone, that being said, I did accomplish a few things. In my last post I mentioned how I have several things going on at once in my sewing room and how that didn't really mesh well with my personality. 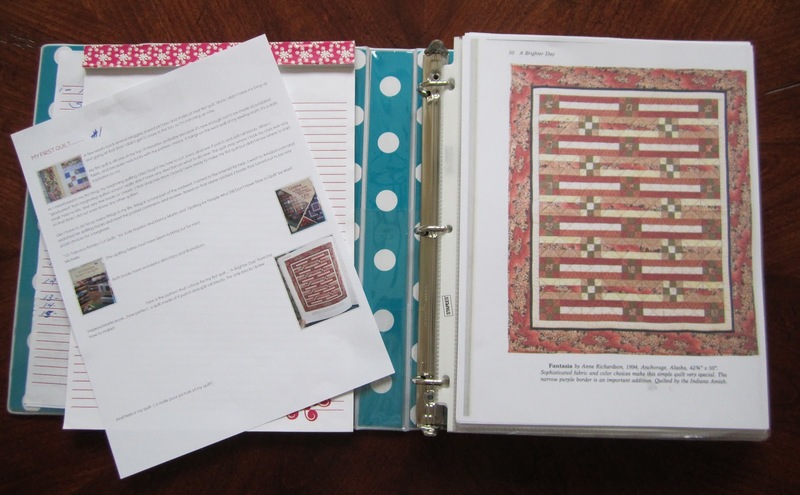 I have all the respect in the world for you quilters who can have projects stacked in various stages of completion all over your sewing room and how you just work on whatever calls your name any given day. I am the polar opposite of that. Someone suggested my happiness meter would rise and my stress meter would drop if I could take a couple of things off my To Do list. So that's how I spent my weekend, moving that happiness meter in the right direction. 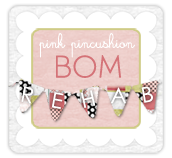 Here's what was on my sewing room list, 3 Barns, Blogger Girls BOM, mini churn dash project, pineapple quilt project and my cleaning out my stash project. Remember this pictures, one of my favorite red things, 35 pounds of red fabric? 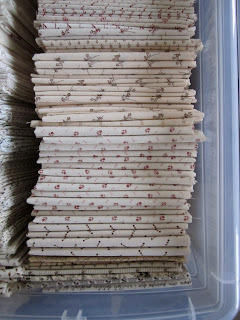 And here's where it went, I cut over 100 five inch squares for my mini churn dash project. This stack of 5 inch squares is 5 inches tall, how perfectly zen is that. Additionally, if I didn't think I would use the red fabric in that stack for sashing or a border, I cut the piece into fat quarters and moved them to my fat quarter bin. I also cut the 200 light strips that I needed for my pineapple quilt project, the strips are all cut and the whole project is now stored in these project boxes in my closest (out of sight out of mind), ready for their turn at the sewing machine. 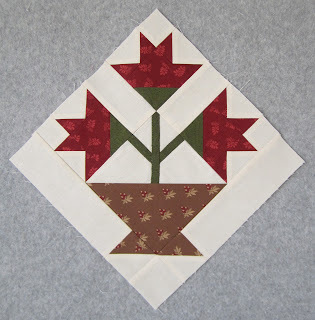 This would be a great retreat project, pretty mindless sewing, but I don't have a retreat coming up, but I'm considering this project done for now and off my To Do list. And my 5 inch blocks are stacked in my mini churn dash project basket. I leave it setting out, because I think those blocks look cute in that basket, but I'm removing this project off my list for now too. I've been trying to clean up and clean out my stash for the last couple of months, but I really didn't have much of a method, over the weekend I set up this sorting area in an office area in our house. I think its original purpose was a study/computer area for the kids who would be inhabiting the three bedrooms that surround this area. I'm repurposing this spot for now, for however long it takes me to go through and organize my fabric. I found that it's easier to sort my fabric when there is direct sunlight streaming through those windows. 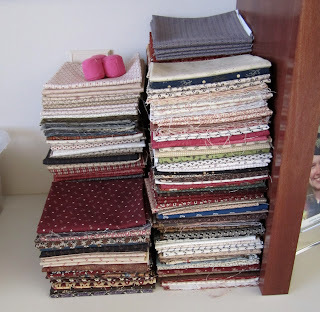 I'm going to spend at least one hour a day going through and organizing this fabric. Just having a plan and a place to execute my plan makes me feel like I'm accomplishing something. The pink basket on the floor is collecting fabric looking for a new home, and the two boxes to the right of that bin are packed and ready to be shipped to their new home, progress! I also mentioned some home improvement projects driving me crazy, but that's not really what's going on, a home improvement project would be fun, what we're doing is home maintenance fix-up projects. Our house is nearly 15 years old and it appears that 15 is the lifespan of most things in your home. And I'm even fine with the fix up projects, but they just don't seem to end. We replaced the furnace but the installer did a poor job glueing the exhaust pipes together which are now leaking and ruining the ceiling and drywall upstairs, fun! And at first I was very excited about the new garage door openers, garage door openers do really fun things these days, like lighting up the garage whenever it spots any movement, automatically closing when left open for a specified amount of time, opening even when the power is out, and providing the time and temperature in the garage. But after the installation process drug out over two days, and I gave the installer's truck a jump because his battery died, and then heard, "I'm not sure why the door won't close right, you need to call a garage door repairman" I wasn't happy. Really, it closed right before you came. We are also in the process of updating the landscaping to only find out water isn't draining properly away from the house. Then the weather turned bad and all I have is a backyard of mud, several pieces of earth moving equipment parked in the yard, and a dog who loves mud and white carpet which doesn't. I'm just ready for one job to be done, or spring, I think either would feel really good! The one good thing about having repairmen coming and going, I have to stay home and wait on them, which is time I'm spending in my sewing room, there's always a silver lining!